In today’s day and age, electronic devices available to consumers are ever-increasing and there is a constant push by OEMs to innovate and provide attractive features with cutting edge technology. Fundamentally, buttons and switch components have a wide range of applications from user control on devices and gaming consoles, to simple contacts on electrical panels. Tactility is critical to understand in this space. For example, a stiff button can be difficult to operate if the user needs to apply high force to engage, and a sensitive button can also prove to be difficult as significantly small force can cause unnecessary engagement of the device or panel. Measurement of parameters that simulate user operation of these components, such as touch force, click force, button travel to engage signal, etc. directly affect the end user and are important to monitor. 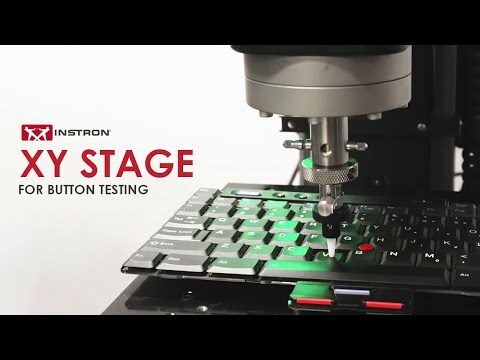 Instron’s 5900 Series single column systems, along with an XY stage, are designed to test buttons and other switch components, yielding results for OEMs to analyze critical parameters. Bluehill® 3 multi-test software solution is designed to create simple user-friendly methods to automate button testing and generate results in a single run. The XY stage allows users to test multiple points on a single button and multiple button samples in a single test run. Results can be exported from Bluehill software to statistically compare and validate the results.